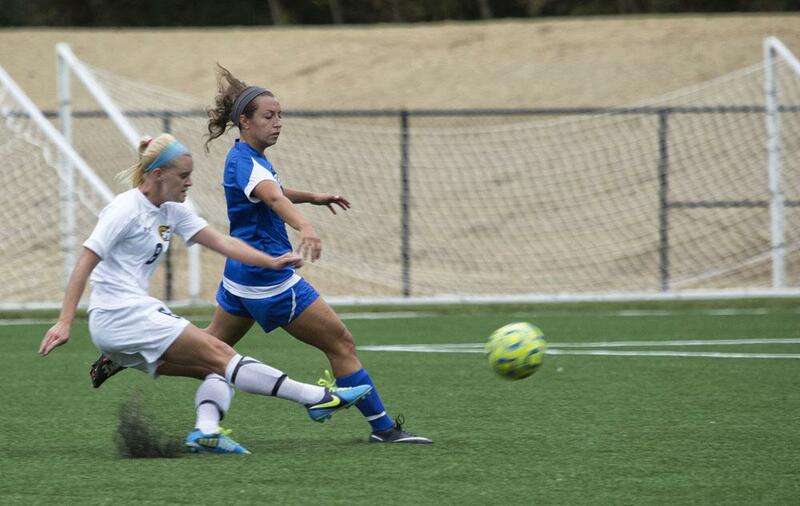 The Shepherd University women’s soccer team currently holds a 5-3-1 overall record and a fourth place ranking in the inaugural Mountain East Conference standings as the first half of the 2013 Fall season begins to wind down. Despite losing their last two games, the Rams have shown they can compete with almost any team they play and they do have the ability to challenge for the first ever Mountain East Conference title. On Sept. 22, Shepherd defeated MEC rival Wheeling Jesuit by a final score of 1-0. The game remained scoreless throughout the vast majority of the match until Kelsey Eagan broke the stalemate and tallied the match winner on a pass from sophomore Kelsey Fletcher at the 87:49 mark. Despite Wheeling Jesuit’s attempts to respond and tie the game in the final minutes, the Rams survived Wheeling’s match-ending onslaught to claim the victory. The next day, Shepherd faced Chowan in a game that needed extra time to decide a winner. Chowan University grabbed the lead early in the match when Erica Jefferson scored an unassisted goal during the 19th minute of the match. After halftime, the Rams responded when junior Taylor Amsley grabbed a pass from Kasey Canterbury and scored to tie the game. This is just further proof of the amazing influence that Canterbury has on a match. The two teams were unable to register another goal in regulation. However, in the 99th minute of the match, Courtney Baltizar provided the critical goal for the Rams thanks to an assist from Annie Orr. Elizabeth Wise, who was named MEC Defensive Player of the Week on Sept. 23, made two saves in goal for the Rams. On Sept. 25, Shepherd suffered their first loss in nearly two weeks when they traveled to Buckhannon, W.Va. to face West Virginia Wesleyan. The Bobcats jumped out to an early lead and they never looked back after Jade Smith scored on an assist from Megan McCoy. West Virginia Wesleyan increased their lead to 3-0 in the second half when Collette Biondi scored on two separate occasions. In their most recent match on Sept. 29, the Rams were edged by Notre Dame College by the score of 1-0. Both teams failed to notch a goal until the 78th minute when Nataile Ockunzzi penetrated the Shepherd defense and scored on a pass from teammate Katherine Beattle. The loss marked the first time this season the women’s soccer team dropped consecutive games. Despite the last two results being of the poor variety, things are definitely looking good for the women’s soccer team. They are within a shout of winning the conference, something that would be very positive for the soccer program considering the way the men are struggling at present.